COCOA BEACH, Florida -- The City of Cocoa Beach will hold a public hearing on whether to make it illegal to possess, harbor, feed, breed, maintain or keep any peafowl during the Cocoa Beach City Commission meeting on June 21, 2012 at 7:00 p.m. The Commission reviewed these Code amendments at their June 7th meeting, at which time the Commission approved the Ordinances on first reading and authorized setting public hearing for June 21, 2012. At that meeting, the Commission also voted to have the fine for the feeding, breeding, maintaining, harboring and keeping of peafowl to be a Class II Violation – First offense $50.00; Repeat offenses $100.00. 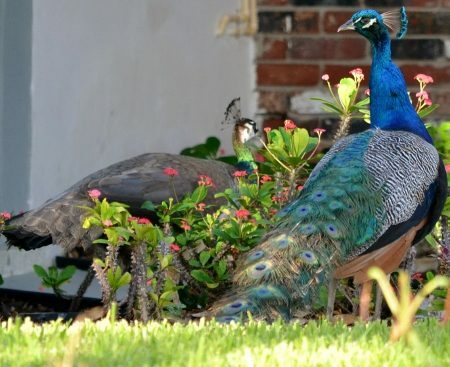 The City's action stems from complaints by Cocoa Beach residents living on Rose Drive who requested that the city remove nuisance peafowl back in April. The City responded to residents' complaints by paying $1,500 to a private trapper to trap and relocate the peafowl to a wildlife sanctuary. Pictured above: A peacock and a peahen stroll across a lawn on Rose Drive in Cocoa Beach, Florida prior to their removal by a trapper. Brevard Times / File.